Hyperboard is one of the newest companies to spring up in China to try to grab some market share from popular Meepo. There have been a handful of such companies. They don’t understand that people trust Kieran and that’s why Meepo is so popular. 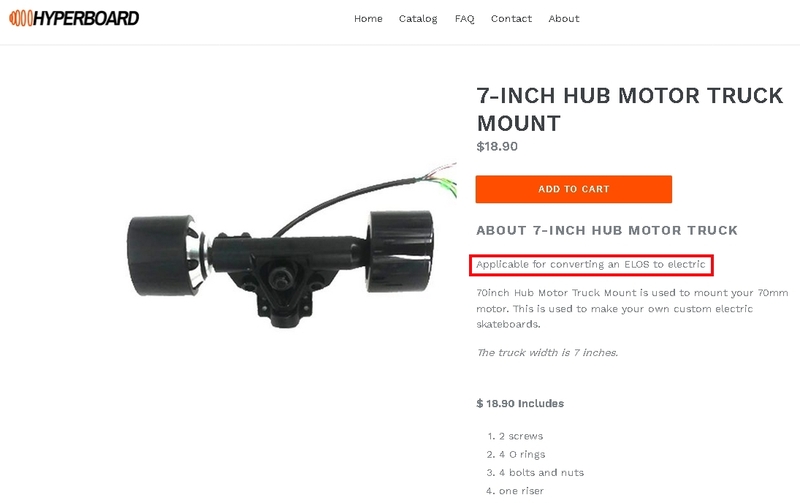 Anyway, Hyperboard quickly pivoted from selling entire electric skateboards to selling parts and accessories. ELOS has 72mm wheels. Unfortunately, this has 70mm, so it’d be a mismatch that would have to be corrected by changing the ELOS front wheels to 70mm too. That’s not something that’s done on the conversions I’ve seen. But we’re getting closer to the parts needed to do conversions outside of Taiwan! In California? Try An ELOS Kick Skateboard For Free!